Councilman Mitch O'Farrell, Essex Development Trust's Bob Linder, with Members of the Los Angeles Historic Theatre Foundation, Hollywood Heritage, LA Conservancy and the Art Deco Society of LA. A rendering of the new apartent complex to be build next to the Earl Carroll Theatre, shown here with the neon that will be restored. Click the photo to see the live segments with Gayle Anderson interviewing Escott O. Norton of LAHTF and representatives of Hollywood Heritage and the Art Deco Society of LA. LATEST UPDATE: On February 24, 2018, LAHTF held the first ever ALL ABOUT behind-the-scenes tour of the Earl Carroll Theatre. Attended by over 200 enthusiastic members and followers, we were given complete access to the interior spaces of the theatre. Our coalition partners (Hollywood Heritage, L.A. Conservancy, and Art Deco Society of LA were invited as our guests and recognized for their efforts, and Essex Property Trust, the owner/developer with whom we negotiated for over 2 years, graciously allowed us the access for the tour. Click here for photos from the event. CONSTRUCTION CONTINUES ON ADJOINING DEVELOPMENT Excavation of the site is almost complete. A huge pit now sits where the parking lot once was. The porte-cochere is protected by construction fencing, and the sides of the pit are shored up to protect the theatre. GROUND-BREAKING: On Monday Oct 17th, the Los Angeles Historic Theatre Foundation joined Councilmember Mitch O'Farrell and our preservation coalition partners: Hollywood Heritage, the LA Conservancy and the Art Deco Society of Los Angeles to celebrate the "ground-breaking" of a new apartment complex by Essex Properties. Our coalition spent two years working directly with the development team to find ways to preserve and protect the Earl Carroll Theatre. Because of our efforts, the developer filed the application and the Earl Carroll Theatre is now a LA City Historic Cultural Monument. 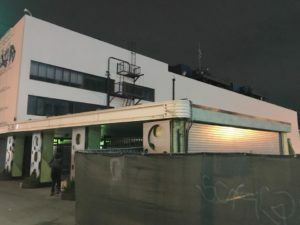 The developer has also pledged to restore the original neon on the exterior, and will be working with LAHTF as we try to find the right tenant to reactivate this space as a performance venue once again. This is a preservation success story, one that came about because of the willingness of this developer to work with our preservation organizations. We hope this can set an example for the future. Earl Carroll Theatre History Earl Carroll built his second famous theater at 6230 Sunset Boulevard in Hollywood, California. It opened on December 26, 1938. As he had done at the New York theater, over the entrance Carroll emblazoned the words "Through these portals pass the most beautiful girls in the world". An "entertainment palace", the glamorous supper club-theater offered shows on a massive stage that featured a 60' turntable with separately operated inner and outer sections. There was also a water curtain, an orchestra pit lift, a small circular lift downstage center for a soloist and a revolving tower of four pianos stage right. The building's façade was adorned by what at the time was one of Hollywood's most famous landmarks: a 20-foot-high (6.1 m) neon head portrait of entertainer Beryl Wallace, one of Earl Carroll's "most beautiful girls in the world", who became his devoted companion. The sign survived several changes of ownership and venue name but was completely removed during major decorative overhauling in 1968. A re-creation made from photos is today on display at Universal CityWalk, at Universal City, as part of the collection of historic neon signs from the Museum of Neon Art. Another prominent exterior feature was the "Wall of Fame", on which were mounted more than a hundred individual concrete blocks autographed by Hollywood celebrities, including some of the biggest stars of the 1930s and 1940s. Later achieving various degrees of fame in films and on television, Jean Spangler, Mara Corday, Yvonne De Carlo, Phyllis Coates, Maila Nurmi, Gloria Pall, and Mamie Van Doren were some of the showgirls who performed there. The facility was a popular night spot for many of Hollywood's most glamorous stars and powerful film industry moguls such as Darryl Zanuck and Walter Wanger, who sat on the Earl Carroll Theatre's board of governors. The theater was sold following the 1948 deaths of Earl Carroll and Beryl Wallace in the crash of United Airlines Flight 624. It continued to operate but by the early 1950s it was falling on hard times. Moulin Rouge - In 1953, Las Vegas showman Frank Sennes reopened the theater as a nightclub under the name "Moulin Rouge". The popular TV contest show Queen for a Day was broadcast from the Moulin Rouge during part of the show's 1956–1964 run. Hullabaloo - In late 1965 it became the "Hullabaloo", a minors-welcome rock and roll club, capitalizing on the popularity of the television variety show Hullabaloo. Kaleidoscope - For several months in 1968 it was the "Kaleidoscope" and featured many top West Coast rock acts, with an emphasis on local bands such as The Doors. Aquarius Theater - Later in 1968, the venue was redecorated in the psychedelic art style, renamed the "Aquarius Theater", and rededicated as the home of a long-running Los Angeles production of the Broadway musical Hair. It was still sometimes used for rock concerts on Mondays, when the Hair company had its day off, and as a result the Aquarius is famous as the place where The Doors performed on July 21, 1969, making live recordings that were later issued commercially. In 1977 it was briefly known as the Longhorn Theatre. It was also called the Sunset Blvd. Theatre, the Star Search Theatre and (in 1993) the Chevy Chase Theatre. The talk show was a disaster and was cancelled after five weeks; the theater reverted to its previous name soon after. Other uses have included being a venue for Jerry Lewis Telethons and Filmex. Nickelodeon on Sunset - In the late 1990s, the name of the theater was changed to "Nickelodeon on Sunset" and it became the headquarters for Nickelodeon's West Coast live-action television production after the theater was acquired by the cable television channel Nickelodeon. Some of the shows filmed there for Nickelodeon include the ten-season run of All That, The Amanda Show, Drake & Josh, and more recently iCarly and Victorious.